This Frog has similar programming to the Dragon pet. The hatching sequence is very similar. It shows animations of a beach with birds when it's hatching. The baby is extremely cute and reminds me of a Tamagotchi angel lol It has the basic functions of a Tamagotchi: feeding, sleeping, discipline, game, shower, medicine etc. I actually quite enjoyed this pet and found that it did not die nearly as easily as the dragon. I'm not sure if it has more than one growth progression since I've only raised it one time. Once it got out of the toddler stage it wasn't nearly as cute since it just turned into a regular old frog. The beeping was soft and cute. The buttons are a hard plastic instead of your typical soft rubber feeling. I would say this is a good pet for those looking for something cute, but a little more masculine. I have never seen this pet anywhere else so I'm assuming it is rare. Some of the text is in Japanese, but it's pretty simple to figure out. I don't know the price of this pet. 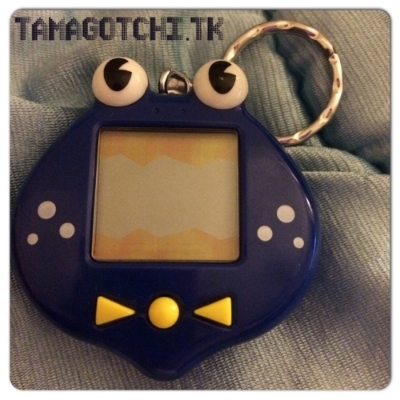 We got it a long time ago when virtual pets first came out. I've never seen it anywhere else online and I don't even know what it's actually called, so I am assuming it must be sort of rare, therefore I don't know what the price is.